It starts with rain - of course. Roman Britain = rain. It is known. Wikipedia calls this series 'historical fantasy'. On the basis of this first episode, it looks like it's somewhere on the border between fantasy and slightly weird historical drama. The Outcast's visit to the underworld could be halluciantions brought on by a dangerous but survivable situation, while the smoke spirit inhaled in the initiation ceremony could be a drug of some kind. The hypnotism is a bit weirder, but still just on the border of the almost plausible. Maybe! Antonius' impersonation of Plautius' grandfather/possession by his spirit is the oddest and hardest to explain, and indicates that perhaps the series is going to venture into fully fantastical territory in future episodes. Much of what we "know" about Druids and British culture before the Roman occupation is educated guesswork, from what archaeological evidence is available (much of it dating to after the Roman invasion and therefore showing Roman influences) and from texts written by Romans, most of whom, with the exception of Julius Caesar, had never been there themselves. Our knowledge of Druid religion and culture is, therefore, very patchy and focuses mainly on the more sensationalist bits that the Romans wrote about, like human sacrifice and strange divinatory practices. The advantage of this for film and television producers, of course, is that they can make up all sorts of things about the Druids and we can't really complain that they're inaccurate, because we don't really know that much about them in the first place. (Of course, the one thing we do know a bit about is the position they buried people in, so that's handy when you're filming a funeral scene!). This series seems pretty engaging so far. I like the opening focus on female initiation rituals, which don't always get as much attention as male ones, and I notice we haven't been told the young girl's name yet. It wouldn't be Boudicca, by any chance? Boudicca's revolt took place just under 20 years after the invasion, so the timescale just about works, assuming this girl gets married and has children within about 5 years. Boudicca was Queen of the Iceni, not the Cantii (called the Canti in the series), but that was because her husband was king, so it's possible she could have married into that tribe from another one. Her hair is brown rather than red, but henna hair dye to colour hair red was around in the Roman world, and Greek and Roman descriptions of hair colours are difficult to interpret anyway, so even that's not a deal-breaker. (Boudicca's hair is described as 'xanthe' by Cassius Dio, the same colour as Achilles' and the root of a common slave name in Classical Greece, meaning broadly blonde, ginger or red). The suddenness and violence of the Roman invasion, appearing out of nowhere through the trees while we're completely wrapped up in the ritual, is really well done. David Morrissey is at his most grim and soldier-y, playing a Roman again, and Zoe Wanamaker has fabulous eyeshadow (though her character doesn't know how to do diplomacy). The main historical issues so far relate to the series' firm insistence that the British and the Romans know nothing about each other. British culture was pretty similar to Northern French (Gaulish) culture back then - you can still see the similarities in Brittany (northern France) and Cornwall - so I'm not sure why the Romans are so taken aback by Britain considering they conquered Gaul years ago. And they had been trading with Britain and had several client kingdoms (British kings who paid tribute and were largely under Roman control) ever since the invasions under Julius Caesar. So the Romans should have some knowledge of Britain, and British girls living on the coast within sight of France should have some knowledge of the Romans. As indeed they clearly do, since Mackenzie Crook's Druid is able to communicate easily with Aaron Pierre's Roman solider of Numidian origin, which means they must both be speaking Latin, the language of communication in the Western Empire and, of course, the language of the Romans, as British Druids are unlikely to speak Numidian and Numidian soldiers unlikely to speak Celtic. Historical issues aren't really the point, though. This is a drama series, not a documentary, and one that is clearly skirting the edge of fantasy. 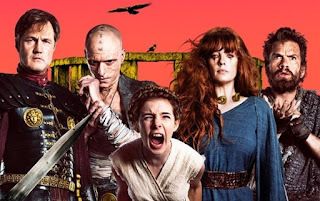 So far, the series has provided likeable characters (Cait/Unnamed/Possibly-Boudicca), intriguing characters (the Outcast), entertainingly vicious characters (Plautius and Antedia) and funny characters (the late Islene, but hopefully there will be more). It's got fairly high production values and seems well paced, so all in all the signs are good that this should be a fun ride - I look forward to the next episode! I imagine this will turn up somewhere in our networks in the not so distant future. I know colors are nearly impossible, sometimes even between modern languages, but I thought ginger was more pyrrhe, hence Achilles' name when he was hiding among the girls. In any case, I hope this comes to Netflix Germany soon. Looks interesting.